It is news to no one that our homes, like our bodies, can be metaphors for our psyches. My deep need to keep and remodel my home after my divorce came from having been dis-lodged so many times in my life. I counted my moves and I have averaged once per 16 months until I moved into my current residence, where I dwell. The Occupy Movement coincided with my divorce. At the time, I began to ponder the concept of ontological homelessness and how our country’s housing crisis has caused a literal and figurative state of homelessness which has deep implications for our cultural psyche. Similarly, the thought of losing my home, the only real one I’ve ever had, and the thought of losing my standard of living due to divorce, put me in an emotional panic. Having grown up desperately poor, I’ve always felt impoverished and poverty has always been a deeply disturbing concern. Always lurking. Today, my lovely remodeled home is showing the scars of Hurricane Isaac. The damage is minor and I feel almost churlish wasting emotional energy on it. The cracks over the door frames have returned, the seam where the quartz counter slabs were joined has fractured minutely, and the grout where the backsplash joins the counter has started to crack. This is damage that I thought would take years to return. The cracking is the product of foundation problems. The foundation itself is secure, but it slips and slides because I live in swampy Louisiana. 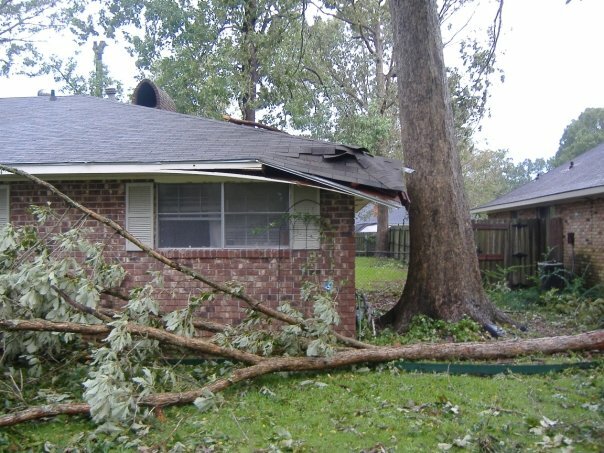 Prior to multiple hurricanes (five real ones, by my memory: Katrina, Rita, Ike, Gustav, now Issac), my lot had several robust trees, thereby earning my neighborhood the moniker of “Sherwood Forest.” One large tree was holding up practically one quarter of the house. Some years ago, after noticing the cracks, we determined these bodacious trees were playing havoc on the ground when the root systems swelled or shrank from the rain. This would cause the house to settle. Our conclusion about the root system was reached based on conflicting information from three foundation repair companies. Given the expensive choice we had to make, we asked the structural engineer who had inspected the house when we first moved in. He explained the root problem. Eventually, between the root system, and hurricanes throwing trees around like matchsticks, we called it quits with the forest and removed it at great expense. So, I’m confident in the foundation. The engineer checked it at three different points over ten years. Removing trees, however, did not solve the problem. Damn you, mother nature. There are still stumps. After stumps are removed, there are still roots. Roots swell and shrink over time until they decay, and the ground continues to shift. I just got lucky because Isaac gave me a deluge that flooded the lot and fast-forwarded the natural house-settling process. It’s like having a fender-bender in your brand new car, rather than waiting for five years worth of parking lot dings to build up and wear the “new” off of it. So, if we spin out the metaphors, there’s lots to be said. A floating, but stable foundation. A house that settled, lots and lots, but not well. Shriveling roots in a formerly robust forest. My lot in life, but one I finally committed to and, in fact, remodeled. Roots from long-gone trees slowly decaying but still causing problems. Fractures returning because you can’t really redecorate over those. I sure did throw a lot of money at the problem, though. The damage is minor, really minor, but I’m focused on it. I can fix it and let it go. There’s a really important lesson in that. But I can’t seem to stop asking what the hell is really going on with my foundation and what does it all mean? I’m ontologically uncertain. A new backsplash obviously hasn’t helped. I’m thankful that, unlike so many, I still have my home. Questions to ask myself and our nation. 1. I am grateful for my home. 2. I am grateful for the quality of workmanship provided by the people who remodeled my home. My interior designer, my general contractor, my cabinet maker, my tile contractor, and my painters were all extremely professional and superior workers. 3. I am grateful that I have a job. 4. I am grateful for the years I spent with a life partner who knew how to manage finances so that I could afford to remodel.